I like the notion of a writer for Slate mocking a column idea for being predictable and trite. 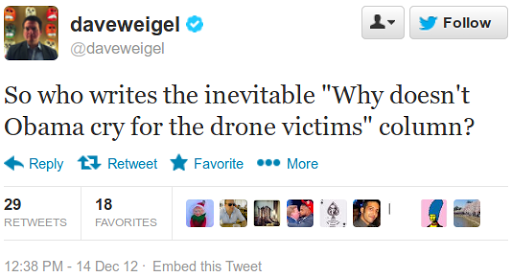 I like that the only time cool Beltway liberals really acknowledge the victims of drone strikes is when signalling that they are too savvy to much care about the victims of drone strikes. I like that this tweet got giggles from more apolitical, “straight reporter” types such as Buzzfeed’s Andrew Kaczynski. Opponents of state-sanctioned murder abroad are objectively insufferable. I like that dead children in Afghanistan, Pakistan and Yemen can at least get a smirk out of an American journalist. I like that, for all their cynicism, more-pragmatic-than-thou progressives get all earnest when their president — and he is their president — displays anything approaching basic human emotion, necessitating displays such as this. You will not ruin this moment. You will not. Postscript: I wouldn’t write such a column for the simple reason that the murder of 20 children in Connecticut should not be about Barack Obama, though some liberals would like it to be. This entry was posted in Dave Weigel, Journalism Watch, Slate. Bookmark the permalink. BTC News writes the column. I didn't write about Obama; he's not central. I wrote about our inability to link what we do to others with what we do to ourselves. Does Grigg referring to it as 'Sympathy from the Devil' count? 3. that's a reply not a retweetYou kids and your retweets and retumbles and fav stars and whatnot. I updated the language. Thanks, very much, for this. I wouldn't write such a column for the simple reason that the murder of 20 children in Connecticut should not be about Barack Obama.Perhaps someone should have told Barack Obama that it's not about Barack Obama.